To support the hexagonal treehouse around a single spruce, Pete used a series of massive knee braces that fork near the top. This design, pioneered by Ricardo Brunelli, provides support to more areas on the platform. It also forgoes the need for beams as structural supports. The crew also installed beefy metal hardware, including bucket tabs and knee brace boots to fasten the supports to the tree. To accurately place the hardware, the crew used a collared jig that they wrapped around the trunk. The jig showed the crew where to install each tab to create a completely level platform. Susan and the crew called the Sitka spruce "Zeus" in reference to its monumental size and regal reach. Zeus stands nearly 250 feet high - one of the tallest trees NT&S has ever built in! Sitkas can live up to 700 years and are the largest species of spruce in the world. Zeus resides on the side of a steep hill, making him difficult to reach with building supplies. To solve this problem, the crew constructed a high line zipline that ran from the hilltop to Zeus. This zipline enabled the crew to send materials and tools down the slope without much heavy lifting and weed-wacking. The steep slope, high elevation of the treehouse, and single-tree design made for a challenging (but immensely fun!) build. DEVIN, CHUCK, AND ADAM WORK ON PIECING THE PLATFORM TOGETHER. CHUCK IS ASKING IF HIS BEARD LOOKS GOOD ON CAMERA. HENRY AND ALEX PONDER LIFE'S MOST ESSENTIAL QUESTIONS. PETE ENTHUSIASTICALLY OVERSEES THE BUILD (THAT, OR SOMEONE JUST TOLD HIM IT'S LUNCHTIME). A bridge bookended by sturdy staircases leads from the hilltop to the treehouse deck. To make the treehouse cat-friendly, the crew added an outdoor litter box area. The littler box is hidden beneath the first rung of the ladder, and can be pulled out for cleaning. Susan's cats can access the box through a kitty door that leads from the treehouse living room to a plexiglass-enclosed area on the deck. This keeps the cats safe and their odors out! The ladder provides access to the roof for Susan to do any repairs or upkeep. There's also a small viewing station on top of the ladder for a mini crow's nest experience. Pete was immensely inspired by visiting Ricardo Brunelli's stunning single-tree treehouses in Brazil. He was especially impressed by Brunelli's innovative techniques for keeping water out of treehouses that include trees inside. Brunelli pioneered the "Brazilian necklace," which diverts water from the trunk of the tree to the weatherproof roof. The necklace consists of jute rope that is wrapped around the trunk, with the tail ends extended toward the roof. The rope is secured with screws and zip ties, and the ends of the rope are singed. Tar is then applied between the rope and tree, and down the tail to create a simple trough that prevents water from flowing down into the treehouse. Pete applied Brunelli's brilliant technique to this Sitka spruce treehome. The lounge is illuminated by windows and a skylight. Interior designer Tory Jones hung driftwood from the wall to create a natural-looking playground for Susan's cats, who love to climb on shelving and mantles. Zeus is the focal point of the bedroom - imagine waking up to this beauty every morning! The crew made sure to leave three to six inches of space around Zeus' trunk in order to allow room for growth. Thick rope wrapped around the trunk both inside and outside prevents the elements from sneaking through those gaps. Nothing beats views from the trees! Western red cedar glows golden in the sunshine. And natural cedar branches give a rustic feel to the railing. To unite the roof rafters around the tree trunk, the crew installed a metal collar atop the treehouse. The rafters landed on this metal ring. The crew then applied weatherproof roofing and tar on top of the rafters and metal ring, and added the Brazilian necklace to further divert water. Behold Zeus the Sitka Spruce! 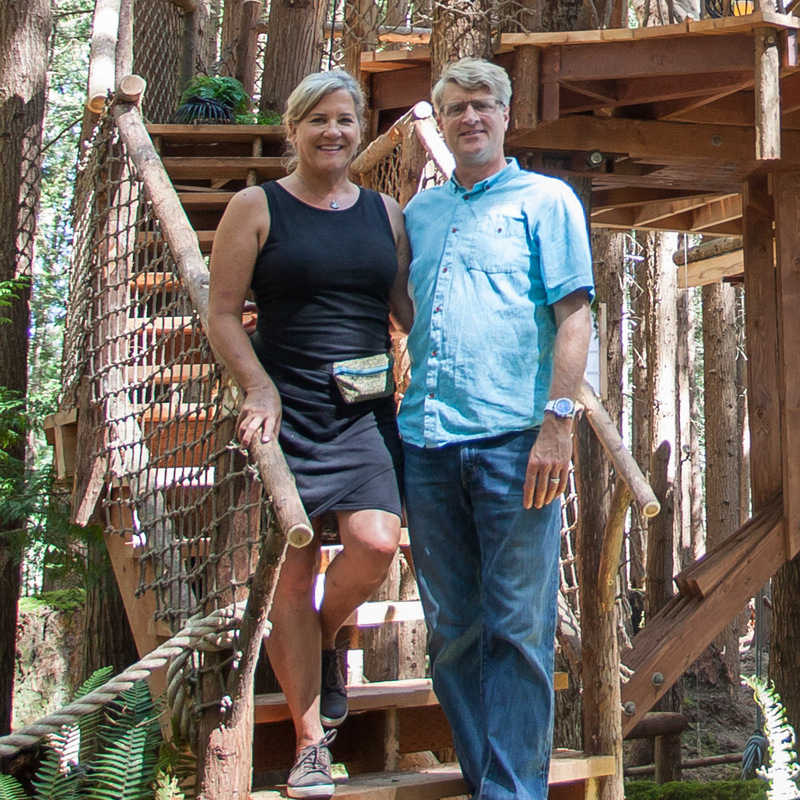 Susan's Sitka spruce treehome was one of our favorite builds of all time. The location was breathtaking, and the single-tree design made for a fun and unique challenge. Thank you, Susan, for an amazing build! To stay updated on all things treehouse, please follow us on social media and subscribe to our newsletter. To the trees!